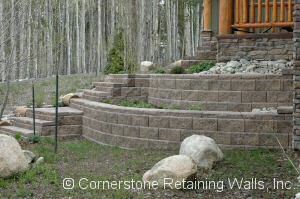 Why Hire Cornerstone Retaining Walls, Inc. Anybody can install pavers or build a retaining wall, but not everyone can do it right. Most people understand that when it comes to any kind of construction work, improper installation, skimping on material, and taking shortcuts will almost always result in problems down the line. Poorly constructed retaining walls will eventually fail. Improper grading will result in drainage problems and soil erosion. Pavers will sink, concrete will crack, and the list goes on and on. 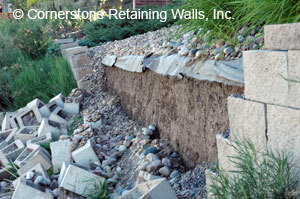 At Cornerstone Retaining Walls, we believe in doing it right the first time. We use high quality, durable materials and take the time to install everything properly from the bottom up. We were called in to give an estimate on repairing this wall. It failed due to lack of reinforcements and improper drainage. Most of the time, the only way to repair a failed wall is to tear it down and rebuild it. 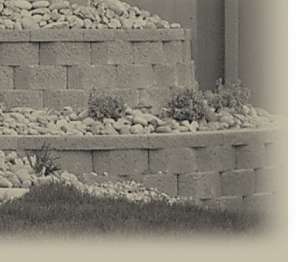 Unlike landscape companies who install retaining walls on occasion, building retaining walls is our primary business. We've done the same kind of work for 19+ years, and we've become experts at it. We know how to make little adjustments here and there that will add stability and longevity - and that will make your wall look nicer, too. We've worked in a variety of environments, from the flat, eastern plains, to the Denver metro area, to the foothills, to the steep and rugged mountains. We've built everything from small landscape retaining walls to tiered retaining walls up to 36 feet in height. Many landscape and retaining wall companies underestimate their costs in order to make their bid price more attractive. But when it comes time to do your project, they are forced to pinch pennies, take shortcuts, and rush through the job in an attempt to turn a profit. When we bid a project, we make sure that all the materials, labor and machine costs needed to complete the job are included in the bid price. Our bid may not be the lowest one you get. However, you can be assured that it includes everything needed in order for us to produce a high quality retaining wall or paver project that you can spend a lifetime enjoying. No cutting corners, no shoddy work, and no excuses means no worries for you! If you are the type of person that values quality, reliability, expertise, and reputation, then we might be a good fit. Contact us today for a free estimate. Fill out our contact form or call Clint at 303-564-4175.